It’s Black Friday and the big secret (well, the big but not-quite-secret-because-several-people-knew-about-it secret) is finally out! Brimstone Press has finally flipped the switch and decided to blow the lid off this indie publishing thing by splashing out on what we believe to be the world’s biggest dark entertainment magazine. 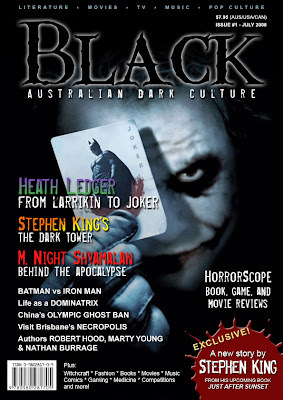 Yes, as was mentioned on the Southern Horror Yahoo group ages ago, this is our ‘Kanga’ Rue Morgue, and with a huge print run, national news stand distribution, and a forthcoming national media campaign, BLACK: Australian Dark Culture magazine, will be kicking arses and taking names! BLACK is not just a horror magazine – it covers the gamut of dark pop culture and entertainment. For example, issue one (launching in July) has features on Heath Ledger in his fateful role as The Joker in The Dark Knight, an interview with M. Night Shyamalan, and an Australian exclusive – a story by Stephen King from his upcoming book Just After Sunset. Plus, there’s HEAPS more! BLACK is a dream come true, and the product of a couple of years of blood, sweat, and the occasional tear. I hope it captures the public’s imagination and puts Aussie dark fiction and dark culture squarely front and centre into the public eye. Thanks to everyone who has wished us well with BLACK’s impending launch. Your well wishes have really buoyed us. Most importantly, if you want to support the mag, spread the word, recommend it to friends and colleagues, and urge them to subscribe – it’s great value and a fantastic read!